Some comics are meant to be more disorienting than others. When you don’t know what’s going on in a story, it’s due to one of two things: author intent or bad writing. Author intent eventually reveals itself. Bad writing usually won’t. 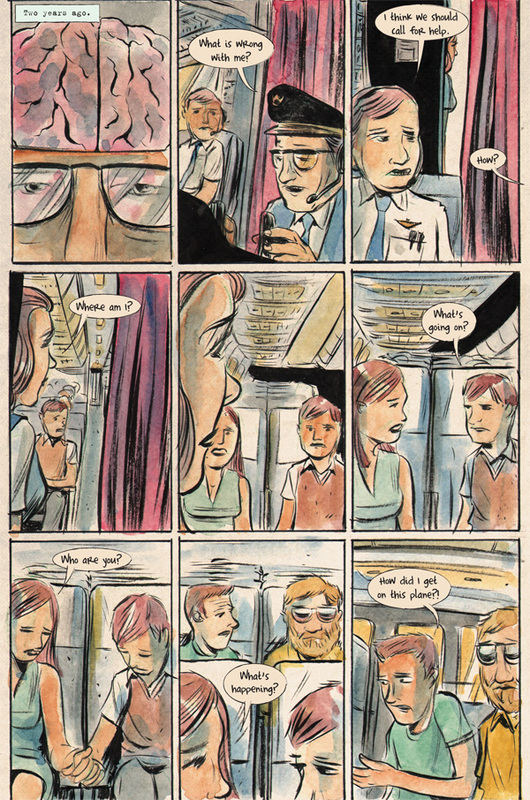 Matt Kindt’s style is amateurish on the surface, but pay attention for a few panels and you’ll see that he’s got a mastery of shape and flow, and if his irregular characters are not deliberate then they certainly are not distracting. There’s a dreamlike quality to the loose and feathery contours of his brush strokes, and Kindt’s understated watercolors and textured backgrounds are evocative of the story’s mood and setting. 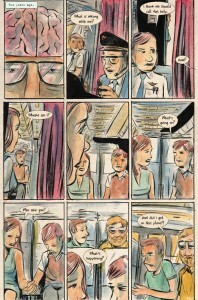 MIND MGMT interiors are printed on soft newsprint, a rare thing in comics these days. It lends the colors a muted quality and has no glare, making it easy reading in light from any angle. 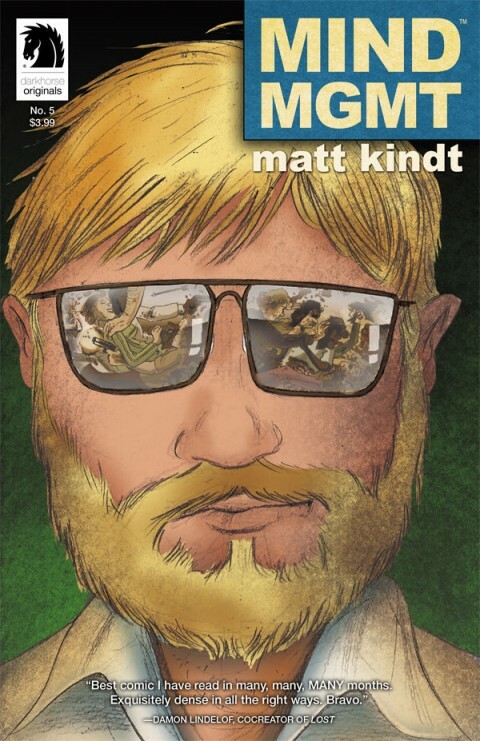 As part of the Dark Horse Originals line, I am curious how much input Kindt had on the physical production of the book. Mind Management is a secret (government?) organization that has been influencing world events from behind the scenes for decades, if not centuries. At its core are agents with mind powers, which can vary from mild telepathy to extreme telekinesis. Like countless other fictional secret organizations, Mind Management can only operate successfully if its existence is hidden from the general public. Therefore memory wipes are pretty standard procedure. But, oddly enough, large scale memory loss events can attract attention in and of themselves. Enter true-crime writer Maru, on the hunt for mysterious Mind Management agent Henry Lyme. Lyme has left a trail of breadcrumbs for Maru to follow and also kindly narrates her story. Along the way, Lyme’s breadcrumbs slowly reveal the world of Mind Management to Maru, until eventually the pair meet and must survive a final confrontation with the powerful Immortal agents who have been relentlessly hunting Maru and those helping her. Maru’s connection to Lyme is obvious by issue #1, but the nature of the connection is left as a pretty delicious mystery through the end of this first arc. MIND MGMT features lots of extras and easter eggs, making each monthly package a pleasure to unravel. 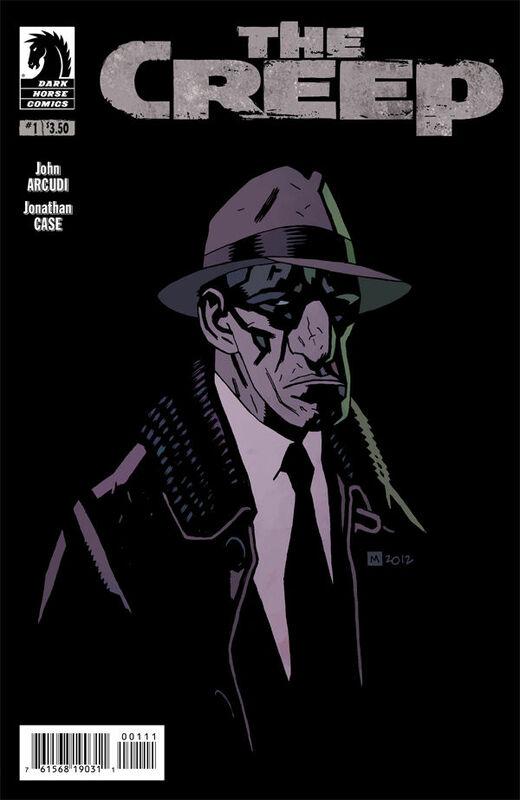 Each issue has a backup story that fleshes out the world, and another short story spanning the inside covers lends some historical context to Mind Management activities. Along the left gutter of each page you’ll find tidbits of the Mind Management Field Guide, which sometimes seem related to the action on the page and sometimes not. 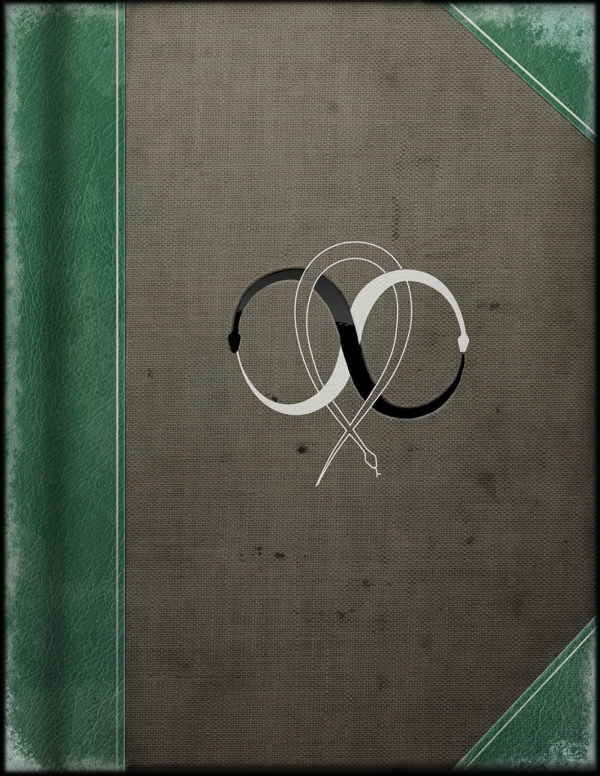 If you collect the first six issues, you can assemble the back covers to reveal a secret code granting access to a video and other extra content on Kindt’s website. I have no doubt that I missed a few other goodies, and I look forward to reading the first six issues again to pick them up. I also look forward to seeing where Kindt takes these characters from here. When you’re left wanting to go back to a story and rediscover, that’s a good sign that your initial confusion was most definitely author intent. While the monthly format is perhaps not best suited to long tail mysteries, it’s entirely possible to fully enjoy a story without fully understanding it. 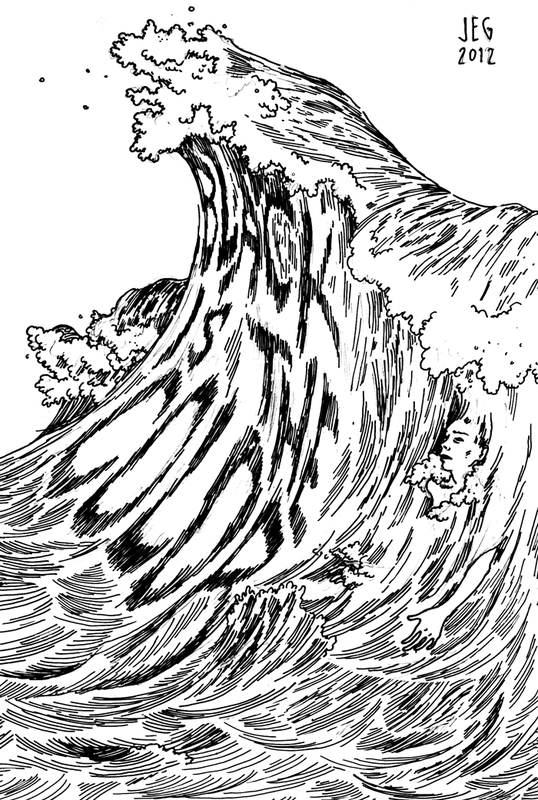 Dark Horse originally released three digital mini-issues, which were collected in November as MIND MGMT #0. 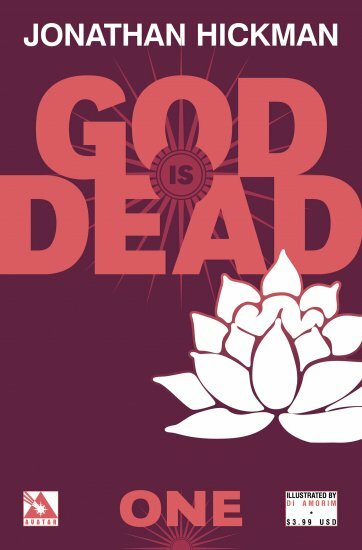 The first arc will be released in a hardcover edition in April.